HomeVery Inspiring Blogger Award from Be Inspired. 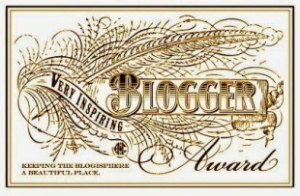 Very Inspiring Blogger Award from Be Inspired. Sometimes things come out of the blue. For me most of the do. Yes I can make a joke or two. But I only will get by with a few. One of those out of the blue moments occurred when I received this particular Very Inspiring Blogger Award from Be Inspired. In all honesty from the site I believe I will be enjoying digger deeper into what is to be found there. Then on top of that to know who nominated this particular site makes it even more interesting, StantonSunshine. I encourage you all to visit both sites to see why they received their nominations. I don’t think it will take you long. I’ve decided to do my seven facts a little different than usual. Since this is the Inspiring Blogger Award I wanted to share some facts that I hope might inspire someone reading. And if you do go to my page and read my work, just know some of it is just getting things out of my head to get rid of it. That’s the great thing about writing, getting rid of the clutter. After high school I didn’t go straight into college. I worked for a few years at various jobs. Once I was ready, I was ready. I made the Dean’s List and all of that type of thing. I mention this because some people feel pressure to immediately go to college or some feel that it’s been too long to go to college. You’ll know when. I didn’t have the greatest biological father. A lot of people can say that. For some it may pretty much destroy their lives. I ended up with a great step-father, who I refer to as my father now. But as a result of those early years I have a love of children, not necessarily wanting to throw myself into the middle of a bunch of 1st Graders, but I love to see happy kids. Whenever I would work in a classroom of young ones the inevitable would happen . . . the lap time. Of course I would then stand up the rest of the day. I know I may look like a big teddy bear, but there are some things you just have to be aware of these days. But I’m good with kids even though I say they’re not my specialty in the education field. The first girlfriend I had basically was using me to make her ex-boyfriend jealous. It didn’t last long. I wasn’t happy about it, but as time went by I realized some people aren’t worth the memories. Prayer works. I know it does because I’ve seen it in action. People say things happen by coincidence. No, not so much. I’ve prayed specifics and they’ve happened. I’ve prayed for things doctors have said would never happen, and they happened. I know God doesn’t always answer us the way we want Him to, or sometimes people don’t realize the answer has been given, but it’s there. I didn’t become a comic book artist. Does that mean God didn’t answer that prayer? No, it means He said no, or it might even be a ‘wait’. But I turned to writing. I am drawn to those who need help in some way. It doesn’t start out as such but somehow over time I discover I am in a new friendship for a purpose. Again, I don’t believe in coincidences. I may help that person to the point of mental and physical exhaustion, but I will help them. And I know that the friendship will probably move on and away at some point but I like to hope I leave the person in a better way than when I stumbled upon them. I was about three months away from being diagnosed as diabetic when I had a fall that changed my life. I was already on high blood pressure medicine so add being diabetic to that and wow. But the doctor was giving me a chance. After the checkup I then had the fall. There was nothing I could do with my life at that point but I knew somehow that I needed to lose weight. At the next checkup after the accident I was no longer prediabetic, and I no longer am on high blood pressure medicine. I set my mind . . . no, I changed my mind to know I could do something and I did it. I have Fibromyalgia and Migraines, along with Osteoarthritis. I’m in my early 40s. I face a future without the ability to work, and judgments of people who see a healthy me and wondering why I am a lazy bum. I blog. I share whatever comes to this odd mind of mine and somehow some of it speaks to some people. I can stop when the pain gets too bad. I don’t get paid in money, but I feel I have worth. As for being a lazy bum? It’s kind of funny. I would kind of like to wander around their home one day unannounced and see how perfect their home is and their life is. The people that count in my life understand me and that’s all that matters. What makes some qualify as an Inspiring Blogger to me? I believe for one I have to be able to connect in some way to the person behind the blog. There also needs to be something more than just talent. I look for sincerity behind the mirror that is my laptop screen. Brett of Brett’s Future-A recent addition to my family of Reader Friends, Brett and I share some similarities, partly being of comparable age and insanity of having done the corporate world angle to now venture into the world of words. Hannah at Inked Roses-I met Hannah during Writing 101 for Blogging University. I have to say that I’ve seen her comment and pop up from time to time around my blog and there is always a sense of honesty in her likes. I enjoy that. Revisiting her site for this award I am blown away by her storytelling. Her Writing 101 material is dead on and she shared things in a way I couldn’t. A great writer with a delicate touch. I want that, but I’m heavy handed and plodding. I admire her. I want her to do more. I want to see what else she can do. That wanting inspires me. Know what I mean? If you don’t want more are you inspired? KiwiBee at Snap Thoughts-Life is an adventure for this young lady. I admire her exploring her world. Looking at her blog more for this award I am more inspired than when I first selected her. An American in Paris? No, try South Korea. From Wyoming to South Korea? Read her About to find out. I love journal entry style she uses, and the photography of the country she now lives in. Her and her fiance also have another blog together Korea Bound that I am about to start looking into. Dazzling Whimsy– I’ve followed her blog since she began and the inspiring part is how it has become a bright and shining spot to escape to. Her photography is of everything around her with beautiful flowers and daughters, and yes the daughters are little girls with brown and or hazel eyes. So of course I was sucked into that world. Take a look at her articles and you see a Mom who loves her kids and apparently does everything possible to give them the best life she can. Who isn’t inspired by that? Also she doesn’t just share a photo she also gives a story behind it. I like that for an occasional change if the is a real story to tell. She has the stories. I am supposed to nominate many more, but over the course of time I’ve been through many and I follow so many blogs that it’s difficult to keep all of them sorted properly. My apologies but at times the combination of concussion recovery and Fibromyalgia take their toll and now is one of those times. I will nominate others at another time perhaps once things are better but for now I believe I have given quality blogs for you to take a look at. They are different from each other and I believe you will find enjoyment with each. Congrats Ron! You deserve every award out there for being helpful and inspirational. Your every day is an inspiration…congratulations Ron. I can feel the love emanating from your posts – love of your craft, your faith and your people, just to name a few. I am inspired. Your blog is very interesting and inspiring. I am a new blogger, I used to write before as well but due to lack of motivation all went in vain. My husband is very supportive. I must say he is my STRENGTH. After reading this blog I can say that its inner strength, self motivation and a positive support which leads to a perfect life and make you unique in the crowd. I would love to read your blog every time as it motivates others as well. Hi Ronovan, you wrote a beautiful response to your nomination. It helped us get to know you better. 🙂 It’s okay that you didn’t nominate 15 people; I always say for this type of thing, it’s fine to do what you can do and don’t worry about the rest. You are VERY inspiring — thank you. Congratulations! I’m new to your blog and very much appreciated hearing your personal story. You are an inspiration. I also don’t believe in co-incidence. I had some long comment in here, but decided to delete it. I will send you a link for something that I heard recently, when I find it – er might take a while because I’ll be out of reach next week, but the week thereafter I’ll go looking for it. my site not working corerectly in Explorer but looks great in Safari. Do you hasve any tips to help fix this issue?